Frederick W. Humphries, the mysterious “Shirtless FBI Agent” who began the investigation that led to the resignation of David Petraeus, has broken his silence to say he did not send Tampa socialite Jill Kelley any pictures of a sexual nature. While not denying the now notorious, but unseen “shirtless” picture exists, Frederick W. Humphries, 47, said the photograph was sent as a “joke” and described it as him “posing with a couple of dummies”. Refuting media suggestions that the picture was sent because he had become enamored with Jill Kelley, the decorated FBI agent said that the photo was sent years before she contacted him about threatening emails she received from David Petraeus’ biographer-turned-mistress Paula Broadwell. According to the general counsel for the Federal Law Enforcement Officers Association who have spoken to Frederick Humphries, the FBI counter terrorism agent only passed on the information Jill Kelley provided him with and played no part in the subsequent investigation. Lawrence Berger told the New York Times that Frederick Humphries, who played a key role in stopping a terrorist attack aimed at blowing up Los Angeles International Airport in 1999 and his wife had been “social friends with Ms. Kelley and her husband prior to the day she referred the matter to him”. Lawrence Berger denied any suggestion that Frederick Humphries sent inappropriate shirtless pictures to Jill Kelley during the course of the investigation which has now engulfed the intelligence community in Washington. “That picture was sent years before Kelley contacted him about this, and it was sent as part of a larger context of what I would call social relations in which the families would exchange numerous photos of each other,” said Lawrence Berger. Claiming that the picture was sent as a “joke”, Lawrence Berger said that Frederick Humphries was “posing with a couple of dummies” at the time of the photograph and that it was not sexual in nature. However, those with knowledge of the investigation that Frederick Humphries sparked said that he was given a dressing down by his superiors for trying to push the complaint forward. In fact, according to the New York Times, Frederick Humphries believed that the case was purposefully being stalled for political reasons. So much so, that in October, Frederick Humphries contacted Representative Dave Recihert, a Republican from Washington State, where Humphries had worked before to ask for his help – purposefully going over his bosses heads. Dave Reichert directed him to House majority leader, Eric Cantor who eventually passed the message onto the FBI director, Robert S. Mueller. According to Wired Magazine, Eric Cantor and his staff personally met with Frederick Humphries in October but were unable to act on the information he was giving them because they doubted his credibility. They also had no idea that FBI were investigating David Petraeus in the first place and after conferring they decided to contact FBI Director Robert Mueller on October 31st. One week later, on November 6th, Election Day, Robert Mueller went to James Clapper the director of national intelligence and David Petraeus’ immediate superior – who urged him to resign his position as head of the CIA. In fact, the House Judiciary Committee has written to Robert Mueller to ask why it took him a week to come forward with the information that Frederick Humphries had given him. This information puts severe doubt over Frederick Humphries assertion that he took no active interest in the case that has caused the resignation of the CIA chief David Petraeus and could cause the downfall of General John Allen, who commands U.S. troops in Afghanistan. “Fred is a passionate kind of guy,” said one former colleague. Frederick Humphries has since been reassigned and his status is being reviewed by the FBI. Jon Adler, president of the Federal Law Enforcement Officers Association, defended Frederick Humphries as an experienced professional. “From my view issues of national security have unfortunately been reduced to a bad episode of <<Real Housewives>>,” he said to the Wall Street Journal. “The photos should not undermine the fact that the agent responded in a timely way and appropriately, nor do they reflect any amorous relationship,” he said. 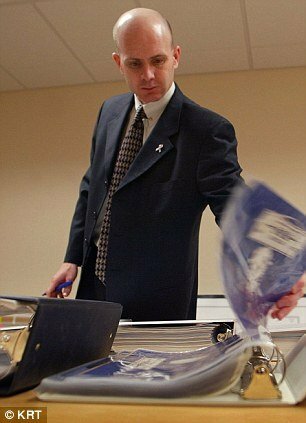 It was Frederick Humphries who passed on Jill Kelley’s complaint about disturbing emails she had received to his superiors in the FBI Tampa field office. The investigation tracked down the emails to Paula Broadwell and subsequently discovered the extramarital affair between 60-year-old David Petraeus and the married mother-of-two. Frederick Humphries grew up in Steilacoom, Washington, attended high school in Canada and rose to become a captain in military intelligence in the U.S. Army. Studying criminology at the University of Tampa, Frederick Humphries joined the FBI and in 1999 he was involved in the investigation which foiled Ahmed Rassam the “Millennium Bomber” who planned to attack Los Angeles International Airport. Two years ago the passionate officer was attacked outside of MAcDill Air Force Base in Tampa by a knife wielding man, who Frederick Humphries fatally shot.